Despite living with serious illness and health issues for most of his 25 years, Calum Nugent packed in what seemed like several lifetimes worth of wonderful experiences that inspired everyone he met before he sadly passed away in May, 2018. The young Letterkenny man touched the hearts of so many - from his friends and family, right through to some of the most celebrated stars of sport, screen and music. Indeed, some of these famous names will play a role in hosting a special charity event being held in Letterkenny’s Clanree Hotel on May 3 to honour his memory and help raise funds to support the work of the Donegal Hospice and The Friends of Letterkenny University Hospital. Calum was born in London and was the first son of Pauline and Eddie Nugent. They returned to Ireland when Calum was two and resided in Carnamuggagh, Letterkenny, for most of Calum’s life where they are well-known and respected within their community. Pauline and Eddie recall a fun loving, adorable boy who always had a permanent smile on his face and a unique sense of optimism and positivity. While he grew up a healthy young boy, as his development continued his mum Pauline, a nurse, says she began to notice that his movement appeared slightly different to his peers. His gait was slightly different and at times he would require balance assistance when negotiating steps or stairs. At the age of six things escalated quickly when he began to develop headaches and sickness and it became clear that something was not right. A diagnosis revealed he had a significant brain tumour at the back of his head near his brainstem that would require immediate surgery. “They put him on life support and it looked like there was nothing they could do for him, but, Eddie insisted that he be brought to Dublin immediately. We left in a blue light ambulance, Pauline said. “Once he got to Beaumont Hospital I knew he had a chance. There was something we could hold on to,” Eddie added. While doctors battled for up to eight hours in surgery to relieve the huge pressure that had built up inside Calum’s head they encountered complications in the form of a bleed that forced them to halt proceedings with the surgery and he gradually slipped into a coma. Weeks passed and it appeared that while he had not deteriorated further, neither had he gained ground and concerns grew. These micro-movements signaled a new hope and they grew from this tiny effort into bigger movements and the slow but steady process of recovery that eventually saw Calum regain much of his movement, speech and ability to walk, was underway. After spending 28 weeks and two days in the Dublin hospital he was able to return home to Letterkenny hospital just before Christmas and shortly after he returned to his family home. Once he began to recover he returned to family life and by now had siblings Rhys, Jordan and Grace to share life with. Over the years of growing up alongside their brother they used to refer to him simply as a “Legend” for the inspiration and positivity he spread to them and everyone else he would meet. Pauline says that’s what Calum’s life was all about - smiling, inspiring others and enjoying the small things in life like sitting in the garden taking in the sights and sounds of nature or hanging out with his friends for coffee. He left everyone feeling better for time in his company and he motivated and inspired many people by his selfless attitude that never saw him complain or see the negative in anyone or anything. A trait that his family say was rooted in his deep faith and love of life. He returned to school and he participated fully in all family events as well as annual trips to see his favourite rugby stars in action in the Heineken Cup finals. By age 15 however, the tumor had returned once again and forced him into a position where he had to undergo more surgery and hospitalisation and it appeared that against all their best efforts there was little more that could be done to help him at this point. Then, as a last ditch effort, one doctor said the only remaining hope would be to try radium treatment but it may be too late to help. His amazing recovery continued and this episode saw the Nugent family resolve to make the most of whatever time they had left with Calum and to live each day to the maximum. This new attitude set them on a roller coaster ride that saw Calum grow and flourish alongside his family and friends and he continued with his huge passion for sport, art and music and became friends with some of the world’s biggest celebrities along the way. A budding DJ with a huge passion for music saw Calum get to meet some of his music idols including U2 stars Bono and The Edge. The U2 guitarist spent time with Calum and his parents right before he was due to walk out on stage to play for a sell-out crowd in Croke Park. On another occasion, at a party hosted by music promoter Denis Desmond, U2’s frontman Bono, having heard Calum was a fan, casually walked over and put his arm around him and said “I’m an aging rock star looking for some love and attention from my number one fan”. He then sat down and enjoyed spending time with the Letterkenny lad and signing a poster for him with the message “God is great and so are you”. As the months passed Calum also got to meet and befriend Today FM Stars Ian Dempsey and Mario Rosenstock, rugby stars including Johnny Sexton, Rob Kearney and Sean O’Brien, movie actor Jonathan Rhys Meyers and many more. Eddie says that he and his son were big rugby fans and each year they enjoyed going on their ‘men only’ rugby trips to the European Championship Cup finals, but by this stage it looked like they may have gone to their last game together. They had plans to attend the 2018 finals in North Spain between Leinster and French club Racing 92, but while in the hospice Calum slipped into a coma. Miraculously, he re-emerged from this unscathed and confidently proclaimed to his family that they would make it to Bilbao and they would see their heros take to the field once again. While it seemed impossible initially that they could make the trip to Spain, with the right help and support from their friends they self-discharged from the hospice and managed to bring all the required medication and equipment needed for Calum and off they jetted to the Basque city. 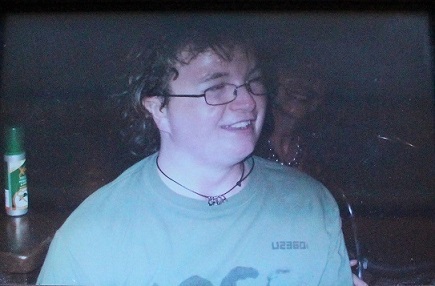 During the journey Calum maintained his trademark smile, upbeat humour and positive vibes throughout. His inspirational journey was matched by the heroics on the field of play as they got to watch Leinster claim an historic victory in the final creating special memories of one of the best trips they had ever undertaken. On their return he re-entered the hospice and a short time later, once again, he slipped into a coma. But, in the true fighting spirit he showed throughout his life he amazed everyone once again to re-emerge one last time. During his life his siblings coined a new nickname for their hero brother - Lazarus - for the way Calum had come back from the brink so many times in his life and once again his spirit was not diminished. Pauline feels that this was his special way of preparing for his final journey and saying a final farewell to the family he loved so dearly before he peacefully passed away on May 19, 2018. He was 25 years old. 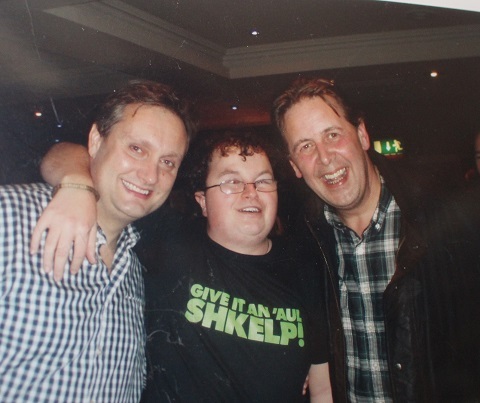 As in his life, Calum continues to inspire in his passing and his life has been the motivation for a special charity night planned by his family that will feature two of his well-known friends radio and television stars Ian Dempsey and Gift Grub’s Mario Rosenstock who are coming to host a special charity night in the Clanree Hotel on Friday May 3. It promises to be a special night with lots of memories, laughs, prizes and a few surprises with all the proceeds going to Donegal Hospice and Friends of Letterkenny University Hospital for new medical equipment. There is also a host of great prizes to be won on the night. Tickets from The Clanree Hotel, The Donegal Hospice and through the Friends of Letterkenny University Hospital priced €20.